There may not be a new Disney Princess this year, but that doesn't mean Disney isn't prepared for it. Since 2019 is odd-number year, there's going to be another D23 Expo this summer, but that's not the only princess-related thing happening in the upcoming months. This year marks the 30th anniversary of Disney's The Little Mermaid, and we can expect Disney to celebrate it in a big way, just like they did for Snow White's 80th anniversary back 2017. Like most princess movies, the Ariel's official anniversary isn't technically until November, but Disney tends to stretch out celebrations throughout the whole year year. The Little Mermaid Anniversary Edition Blu-ray is coming out next month. Maybe if we're lucky, we'll even get that live TV special we were promised a while back. Between that, the upcoming Aladdin remake, the new Dashing Collection for the Disney Store, and Disney's exclusive streaming service, 2019 is shaping up to be a big year for the mouse. The most recent Disney-related announcement for 2019 is the Oh My Disney Dashing Collection, which is now available at the Disney Store and on shopdisney.com. The collection is a callback to the often overlooked Disney Prince archetype, featuring clothing, stationary, bedding, and other fun memorabilia containing images of all the most popular animated men from classic Disney films. 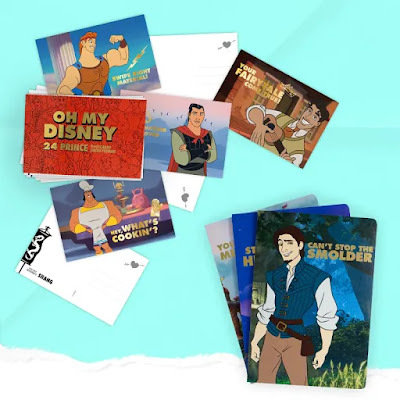 It's interesting that this collection would be released during a time that princes have become nearly obsolete in Disney Princess movies, but maybe that's the reason we needed something to be reminded of how much we love them in the first place. Though the collection tries a little too hard to be hip with tag lines like "Swipe right material" and "#couplegoals," it is the first time that I can recall that the princes have all been featured together in a collection like this without getting overshadowed by their lovely and inspirational romantic interests. I'd be curious to see if it sells enough for Disney to bring the romantic back into their future princess movies, which was openly mocked in Frozen and excluded from from Brave, Moana, and The Nutcracker and the Four Realms. The 30th anniversary Blu-ray of The Little Mermaid recently announced a release date of February 26th. Disney has revealed several of the new bonus features, including new music videos, studio recording sessions, and interviews with actresses who performed the singing voices of previous Disney Princesses. 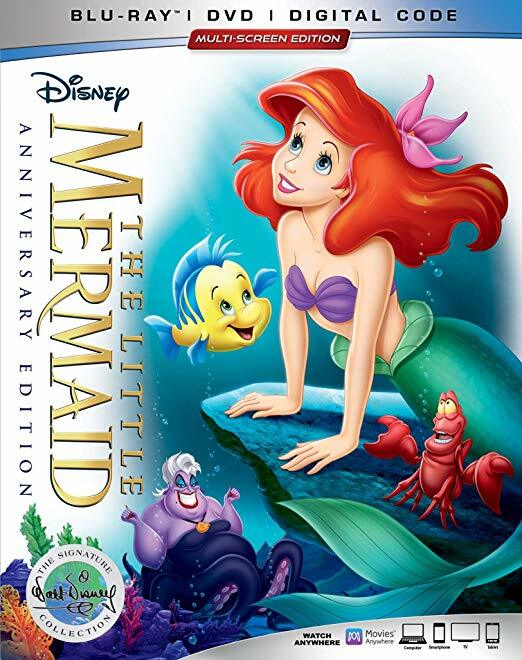 There have been some complaints about the cover art, namely that Ariel's flowing red locks appear to be roughly half the length they are in the film. Unfortunately, this movie has never had much luck with cover art. The original VHS cover suffered endless criticism due to one of the towers on Atlantica's castle in the background resembling a phallic object. The cover of the Platinum Edition lacked the same expressiveness that brought the characters to life in the film. It also darkened the colors in certain shots of movie's restoration, including when Ariel takes her first breath as a human and later when she gets her voice back. These restoration errors were fixed for the Diamond Edition Blu-ray, but that release mixed up two of the shots during the "Part of Your World" sequence, causing a recall on the disc. Here's hoping that they learned from their mistakes. If you are looking for alternatives to this cover, you can buy the SteelBook edition from Best Buy, which replaces the cover art with two paintings by Paige O'Hara, the original voice of Belle from Disney's Beauty and the Beast or the Target exclusive version, which includes a filmmaker gallery and storybook. Disney isn't just compensating for their lack of new princesses this year with merchandise. It's the era of remakes, and it won't be too long before we meet the new live-action Princess Jasmine, played by Naomi Scott. The upcoming Aladdin remake is scheduled for May 24th. Jasmine is rumored to have nine original looks in the film. I'm not expecting it to be much better than Disney's other live-action remakes, but at least it'll give me a reason to get out to the movies this year. The remake of The Lion King is also scheduled to come out later this year on July 19th. It will be starring Beyoncé as the new Nala. The movie features songs that have only been performed in the Broadway version until now. Since I've never seen the play, I'm looking forward hearing Nala's solo, "Shadowland" for the first time in the context of the new movie. As happy as I am that princesses are getting their well-deserved big-screen dues, I am still a little disappointed to not see any original princess movies this year that aren't remakes. I suppose beggars can't be choosers. So, there you have it. We are two weeks into 2019, and Disney is more than ready for it. What are you most excited about this year? Is it the Dashing Collection from the Disney Store or the upcoming remakes of classic '90s films? Perhaps it's the D23 Expo this summer or the Disney+ streaming service. If you're like me, you're probably most excited about the 30th anniversary of The Little Mermaid. I have to say I was surprised by how early in the year the new edition is coming out. I'll barely be finished with Kingdom Hearts III before I get the privilege of enjoying the new cut and bonus features of my favorite film. I can't wait to see what other surprises Disney has in store for Ariel's big anniversary!